As a pet parent, keeping your dog in a healthy, lean body condition is the single most important thing you can do to ensure that your four-legged furry friend has a long, healthy life. But how do you know if your canine companion is underweight, overweight or just right? The answer is simple: by monitoring your dog’s weight and body condition score (BCS). If you’ve never heard of a body condition score, you’re not alone. 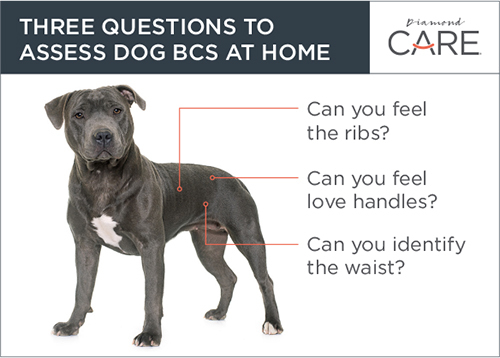 In this post we’ll explain what BCS is, why it’s important for you and your veterinarian to monitor it, and how you can do a quick assessment at home. What is a body condition score for dogs? Body condition scoring provides a convenient, standardized way to assess whether a dog is too heavy, too thin or just right — similar to the human body mass index (BMI) score. Monitoring your dog’s body weight by itself doesn’t really tell you if your dog is overweight or at their optimal weight, although body weight can provide helpful information when tracked over time. When used together, BCS and weight can help you and your veterinarian determine if your dog is getting the right amount of food to maintain an appropriate weight, which contributes to overall health. Both observation and hands-on evaluation are used to assign a body condition score, using either a 5-point or 9-point system. Typically, your veterinarian will evaluate the fat covering the ribs, down the topline and waist, around the base of the tail and along the bottom of the abdomen. A dog in ideal body condition will have an hourglass shape and an abdominal tuck in front of their hind legs. You also should be able to easily feel, but not see, the ribs. More and more veterinarians are tracking patients’ BCS, so if your veterinarian doesn’t say anything about your dog’s body condition at your next routine visit, be sure to ask for his or her opinion. Why should you care about your dog’s body condition score? The good news is that monitoring BCS and weight in tandem can signal small changes that allow you and your veterinarian to take corrective action. And if your canine companion is already overweight, monitoring their BCS during a weight-reduction program can reinforce positive progress even when you might feel none is being made. Does your pet have an easily identifiable “waist”? When you look down from above, do you see an hourglass shape with a waist behind the ribs? Does the abdomen slope upward from the ribs to the front of the hind legs when you look from the side? If your dog looks like a hot dog, chances are they are overweight. Can you easily feel your dog’s ribs? Run your hands along your dog’s sides as if you’re petting them. If you can feel the ribs using only slight pressure, your pet is likely in ideal condition. But if you need to apply pressure to feel the ribs, then your canine companion is likely overweight or worse. Is your dog’s back flat? Can you see or feel “love handles” over the hips or around the base of their tail? Overweight or obese pets may look like they have a wider-than-normal back, and fat stores will be obvious. Don’t forget to compare your dog’s shape to those in the BCS chart. You might also find it useful to compare your assessment with your veterinarian’s evaluation. If you check your dog’s BCS at home and you suspect they are pudgy, you’ve taken an important first step toward addressing the problem: recognition. The next step is to schedule an appointment with your veterinarian, who can create a nutrition and exercise program to help your four-legged friend achieve their ideal body condition and weight.